Thanks to Vitacost.com, I will have the opportunity to review some of the products that they offer on the site. 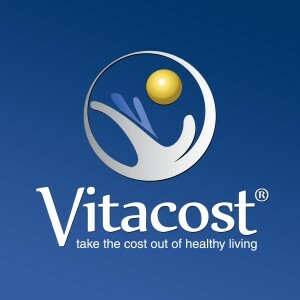 Vitacost.com gives you a selection of of health foods and snacks, bath and body products, natural household supplies, baby care essentials--plus, of course, discount vitamins, minerals, herbs, sports nutrition supplements and other formulas for your nutritional needs. You'll find nearly 40,000 products that help you care for yourself, your family, your pets and your home. Get up to 50% off health and beauty products, vitamins, nutritional supplements, health foods and whole food products. I have tried other gluten free cake mixes and I have not been impressed. They were either dry or just tasted like cardboard but Bob's Red Mill Vanilla Cake Mix was different. The instructions were easy to follow and when mixed there were no lumps and the mixture was smooth. I used a 3 x 9 inch pan and the cake baked perfectly. Unfortunately, I was unable to get a photo of the finished product. While it was cooling I went shopping for a couple of hours and when I returned most of it was devoured by my kids and their friends. They loved it and never realized it was gluten free. I was lucky to try it for myself. It was fluffy, moist and tasted great. I will definitely use Bob's Red Mill in the future. I will be trying their pancake mix soon. The cake mix is reasonably priced and there are many other flavors to chose from. So visit Vitacost.com and check out all of the gluten free products they sell. Was the cake mix good after it was baked? It tasted very good compared to the other gluten free mixes that I have tried. With recommendation from all those who had tried it, I will have to give it a try too. It's so nice to know there is a gluetan free cake mix that actually tastes good. So many glueton free items are so gross tasting! Sounds good - it's tough to find good gluten-free products. Will have to try it out! I trust Red Mill products and look forward to trying this mix and possibly the pancake mix mentioned as well. I am going to take your word for it and try it out because I know I need to leave the gluten alone so I feel better but don't find too much that taste very good to me. Oh wow! I'm always looking for delish gluten free stuff! Thank you for the review, I plan on trying this! I have tried a few Gluten free products and they were horrible. This cake sounds so yummy. I would love to try it. I am a big fan on Bobs Red Mill, so this must be great stuff.